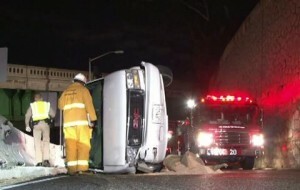 LOS ANGELES – Three Lancaster residents were killed and four were injured early Saturday morning when the minivan they were riding in hit a concrete wall and rolled over on a connector road between the 110 and 5 freeways. Abigail Romero, Katie Davila and Abigail Estrella. Abigail Estrella, 37, Abigail Romero, 19, and Katie Davila, 12, were thrown from the minivan and pronounced dead at the scene of the single-vehicle crash, which was reported around 12:15 a.m. on the northbound 110 Freeway connector to the 5 Freeway, authorities said. “Initial information obtained at the scene indicated the vehicle veered to the right off of the roadway, for an undetermined reason, and collided with a raised concrete wall. This action caused the vehicle to overturn and skid on its right side until coming to rest in the No. 2 lane,” California Highway Patrol Officer C. Stanhope stated in a CHP report. Two men, a boy and a girl – all from Lancaster – were also injured in the collision. 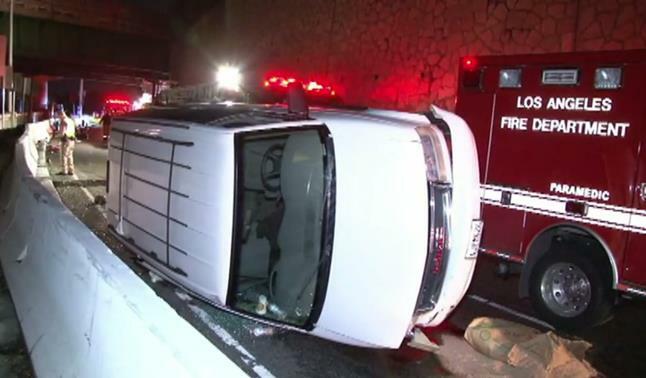 A four-year-old girl received moderate injuries, while a 13-year-old boy, a 36-year-old man, and the 55-year-old driver sustained minor injuries, the CHP report stated. The injured were transported to Los Angeles County-USC Medical Center for treatment. Family members and loved ones will be hosting a car wash on Wednesday, Dec. 4 to raise funds for funeral expenses. 21 comments for "UPDATED: 3 Lancaster residents killed in rollover crash"
I’m so sorry for your loss. I didn’t know the family, however my daughter knew Katie from school. Leeana, can you please notify me with the service information? You can email me at sh.oxley@yahoo.com. Thank you. I used to volunteer in Katies fifth and sixth grade class she was an awesome kid amd I enjoyed reading with her she was little friend. Love you Katie RIP. The driver fell asleep behind the wheel. It wasn’t reckless driving, using cellphones, or anything else. It was simply an accident where the man fell asleep. It’s unfortunate that the deaths occurred and I can’t imagine what the family is going through. If that is the case, I hope this can serve as a reminder that if you are driving fatigued, you are putting people at risk. If you are driving, and you start to feel drowsy, pull over and rest. Driving fatigued is reckless. Sad, it is hard to resist getting comfortable by removing or not wearing the seat belt properly when tired and wanting to relax, and letting a kid lay down for the ride home…. It is accidents like this that are a reminder for me not to do that….. Very sad…. Very sad, Rest in peace!!!! What a shame. May God be with their families during this sad time. RIP to all who are gone. I pray the survivors do well. Can you still be throw from the vehicle if seat belts are worn? only if the vehicle is torn in half…. You still can if your seatbelt is worn half way!! Not generally. If worn improperly (with the shoulder harness behind you) you will still likely remain in the car, but will probably suffer serious lower spine and pelvic injuries. People who are not seat-belted in rollovers are generally ejected due to centrifugal force. My best friend was ejected from a minivan when she was younger. She WAS wearing her seatbelt. She was sleeping, and the seat she was sitting in snapped in half as their car was tumbling. The back trunk door opened and she slid right out. Firefighters claim the sleeping bag she was in saved her life. It helped her skid across the highway.